Scientists are reporting an advance toward scavenging energy from walking, breathing, and other natural body movements to power electronic devices like cell phones and heart pacemakers. In a study in ACS' monthly journal, Nano Letters, they describe development of flexible, biocompatible rubber films for use in implantable or wearable energy harvesting systems. The material could be used, for instance, to harvest energy from the motion of the lungs during breathing and use it to run pacemakers without the need for batteries that must be surgically replaced every few years. Michael McAlpine and colleagues point out that popular hand-held consumer electronic devices are using smaller and smaller amounts of electricity. That opens the possibility of supplementing battery power with electricity harvested from body movements. So-called "piezoelectric" materials are the obvious candidates, since they generate electricity when flexed or subjected to pressure. However, manufacturing piezoelectric materials requires temperatures of more than 1,000 degrees F., making it difficult to combine them with rubber. The scientists describe a new manufacturing method that solves this problem. It enabled them to apply nano-sized ribbons of lead zirconate titanate (PZT) — each strand about 1/50,000th the width of a human hair — to ribbons of flexible silicone rubber. PZT is one of the most efficient piezoelectric materials developed to date and can convert 80 percent of mechanical energy into electricity. 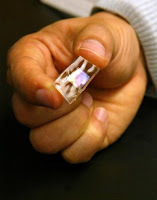 The combination resulted in a super-thin film they call 'piezo-rubber' that seems to be an excellent candidate for scavenging energy from body movements.